Masala Dosa is a very popular dish originally from south India. It has not only become a favorite all over India, it is also appreciated by the visitors from other countries. You could call it South Indian pancake recipe.The plain dosa is made from rice and black lentil(urad dal - split white lentil - black gram dal) that is rich in protein. The masala is the stuffing that is made with potatoes, is the potato subji (also referred to as potato masala, aloo bhaji, aloo subji.) The potato masala is filled inside the dosa and is called Masala-Dosa. The dosas from South Indian (Udupi) hotels are popular the world over. Not just dosas but other items, such as idli, upma, vade, are popular too. Among dosas, there are variations such as plain-masala dosa, rava masala , mysore masala, davangere benne dosai(butter dosa from Davangere), springroll dosa, instant dosa, set masala dosa etc. Dosa is generally served with coconut chutney. But you can also use any other chutney of your choice. Other items such as potato bhaji, sambar, make it more special. Assemble the things for the final step of the dosa. You will find the instructions below for each step. Dosa is one of the easiest things to make. You have the choice to serve it only with coconut chutney. That is what I do when I am in a hurry. How to make dosa batter and prepare dosa. After you have got your dosa batter, potato masala, sambar and coconut chutney ready, it is time to make Masala-Dosai. 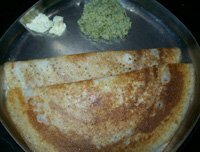 Go to How to assemble Masala dosa page - Masala dosa recipe. Mixed Veg Upma - A savory vegetable semolina dish. Uttapam Can make this thick pancake with leftover dosa batter. Poha Quick recipe made with Rice flakes.